Originally published in 2002, author Martin Jones and Nimbus Publishing are re-releasing their text that claims hockey's birth place is Dartmouth, Nova Scotia. 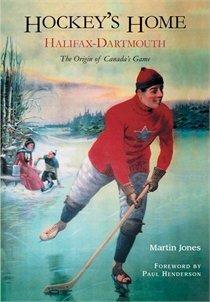 Hockey's Home includes a wealth of information about the origins of the great game of hockey in Nova Scotia with particular emphasis on the role that the community of Dartmouth has played in forming the game. The book includes a foreword by Paul Henderson.